This is one of my mother-in-law and my husband’s aunt Barbara’s recipes. One of the last times, I visited her, she had made this, for my husband and myself. I love this recipe for its simplicity. It has a wonderful tang and a creamy goodness. Perfect for a light and fresh tasting meal. Thanks Alicia and Barbara for this great recipe! I used chicken thighs for this recipe, but you can use chicken breast. Normally, this is cooked on the grill but as I do not have one, I baked mine in the oven. Combine dressings with chicken and let it marinate for at least 2-4 hours. Place chicken in baking pans and cover with foil. While chicken is baking, place remaining dressing in a sauce pan and cook until bubbling. 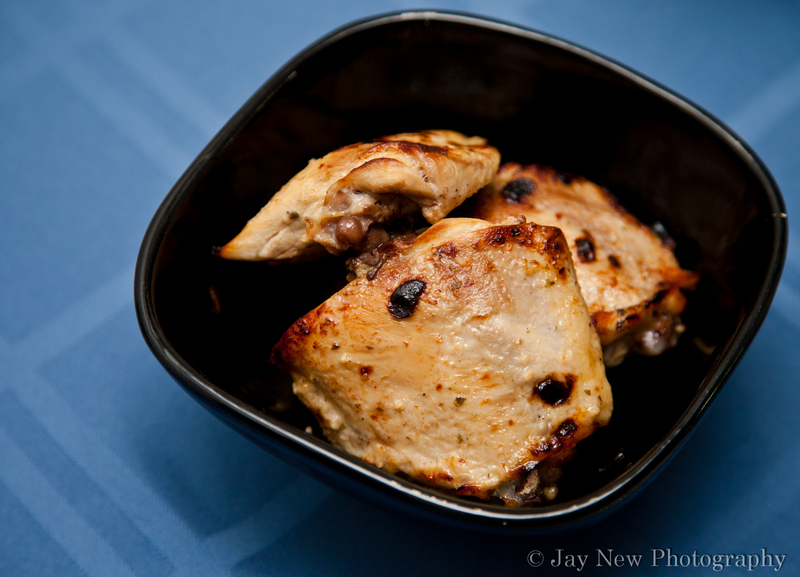 Brush marinade on chicken thighs and broil for 10 minutes, brushing sauce every 2-3 minutes. Make sure you coat both sides and broil both sides. Please check if dressings contain modified starch. Sometimes, these starches may have gluten in it..but unless they tell you that it is gluten free..there is no guarantee. Interesting flavour as I havent tried salad dressing for marinade yet. This looks really easy to try out! Hi there, I’m one of Samina’s friends that also cooks. I use salad dressing as a marinade all the time. Feel free to get creative and make your own (oil, vinegar & your favorite seasonings). Some favorites in my house are honey mustard w/chicken, citrus or mojo if you can find it for pork & italian dressing for steak. The longer you marinade the meat, the more intense the flavor becomes. My only suggestion is marinade for a minimum of 30 minutes. And if you’re health conscious, the light/fat free versions of the dressings work just as well. Good Luck! This just sounds divine!! I love family recipes and I love recipes that are simplistic because the food really becomes the main ingredient. Samina, you have done it again. I will never run out of “What’s for dinner” ideas because of you lol. Mmmm looks so good! I make almost the exact same recipe but with chicken wings! That tangy flavor from the dressing is to die for. mmmm wings.. Hope you are having a wonderful day!